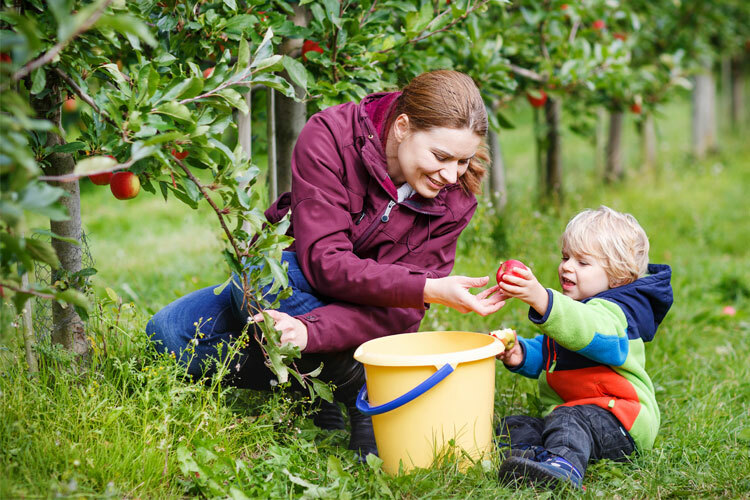 Apple picking season—one of the very best times of the year. The first set of apples are ripe for picking around early September. In Maine, you’ll find apple orchards decorated with bright red apples for as far as your eyes can see. With tons of options across the state, you’ll find the best spots for picking based on your apple preference. Here are our 10 favorite apple picking spots in Maine. Randall Orchards in Standish is located just 30 minutes from Portland. Open late August through the middle of November, you can pick a variety of apples, pumpkins, gourds, and more. The orchard is home to a working cider mill so you know you’ll only get the freshest apple cider in the state. With over 20 apple varieties, you’ll be able to pick your favorites from MacIntosh to Honeycrisp to Fuji. Doles Orchard in Limington is home to more than just apples, throughout the summer and fall months you can pick other fruit like strawberries, raspberries, blueberries, and more. During the height of the apple season, there is always live music playing on Sunday afternoons. With more than 25 varieties on the orchard, you’ll find the perfect ones for your homemade apple pie. Speaking of homemade baked goods, you can buy pies here too! Rocker Hill Orchards is more than just an apple picking orchard, it’s a destination for fall fun. With a corn maze, hayrides, apple cider doughs, and a hard cider winery, Ricker Hill Orchards has fun for the whole family. Growing apples for eight generations, the Ricker family knows a thing or two about apple growing. You’ll only find the best varieties at Ricker Hill, including organic varieties. Hope Orchards has more than 14 different apple varieties available for picking throughout the months of September and October. If you don’t have time to pick your own apples then head to their farm stand to buy a bag and some delicious homemade apple cider made from their own handpicked apples. Apple Acres is a six-acre pick-your-own fruit farm in western Maine. Only a 45-minute drive from the city of Portland, Apple Acres has been in the family since 1949. Open for PYO in September and October, the farm has a variety of apples, including Honeycrisp, Cortland, and others. Their farm stand has apples, cider, baked goods, and ice cream. As one of the oldest apple orchards in the state, Sandy River Apple Orchard has been in the Fenton family since 1852. This large, PYO apple orchard grows over 40 different varieties and is run by the daughter of the late “the Apple Man.” You’ll find unique varieties like the Wolf River, Dollie Delicious, and Wealthy. Opening shortly after Labor Day, Hansel’s Orchard in North Yarmouth will be ready for some early season apples. The farm is a family-run PYO orchard with McIntosh, Cortland, and Macoun apple varieties. Choose from five different bag sizes for all your apple needs. Berry Fruit Farm in Livermore offers pick-your-own apples from September through October. As they like to say, “no other fruit says ‘Maine’ like our apples.” Apple varieties include the classic McIntosh, Cortland, Gala, Zestar, and Honeycrisp. Also, be on the lookout for raspberries and pumpkins, which are available around the same time. McDougal Orchards in Springvale is a seventh generation family farm specializing in apples, pears, and peaches. With a wide variety of apples, you’ll find your perfect flavor here. Open daily from August through October, you’ll find tons of apples and even the famous apple cider doughnuts. Weekend hayrides are free! Located on 40 acres in Limerick, Libby & Sons U-Pick is a family owned and operated farm with fruit picking from July through October depending on the fruit. There is 18 acres of apple trees growing over 18 varieties of apples including the ever popular Honeycrisp. Don’t forget to try the fresh donuts and fruits smoothies made daily.